On April 22, 1889, the last frontier, known as Oklahoma, was opened to settlement. By August 1889, Oklahoma City’s population was 4,000, including ten Jewish men. Fourteen years later, in May, 1903, the reform congregation, Temple B’nai Israel was formed. 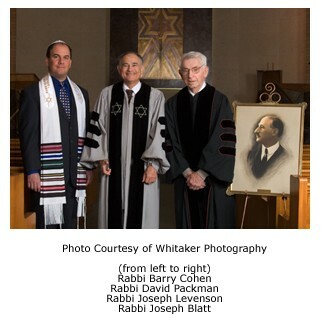 Rabbi Joseph Blatt assumed leadership of the congregation in 1906 and remained for 40 years until his retirement. The cornerstone for the first house of worship at 50 Broadway Circle, was laid in 1907, the year Oklahoma became the 46th state. By 1925, membership had increased to over 160 families and the Temple building was overcrowded. In 1926, ground was broken for an adjoining Temple Center to house the Sunday School, the kitchen, the Temple office, a lounge and an auditorium. Then, in 1929, the depression hit. Western Oklahoma became the ‘dust bowl’ and ‘Okies’ left for California. At the same time, oil was discovered and the Oklahoma City and Seminole fields brought the price of oil down to 10 cents a barrel. Over 3,000 wells were shut down and policed by the National Guard. The sinking of the U.S.S. Oklahoma in Pearl Harbor in 1941 marked the beginning of World War II. The Temple Men’s Club disbanded, and its members left to enter the service. In Oklahoma City, Tinker Field was born and became the country’s largest aircraft repair facility. The city grew in every direction and Lake Hefner was constructed “out in the country” according to city residents.In July, 1946, Rabbi Joseph Levenson came to take over leadership of Temple B’nai Israel. Rabbi Blatt passed away before the year ended. During Rabbi Levenson’s 30 years of service, many changes took place. The Temple bulletin was started, Bar Mitzvah was approved, and the senior youth group joined the National Federation of Temple Youth (NFTY). By 1951, Temple membership reached 250 families and we were again in need of more space. Land for a new building was given by Erna and Julius Krouch. Over the protests of many who felt that 4901 North Pennsylvania was too far out in the country, ground was broken for a new building on February 28, 1954. Temple B’nai Israel was dedicated on September 11, 1955. Additional Sunday School rooms and Krouch Hall were added in 1962. On April 28, 1970, disaster struck. A tornado hit the Temple and a large portion of it was damaged. Oklahoma City was declared a disaster area. The Temple was rebuilt. Help was provided by various churches to which we will always be grateful. In 1976, Rabbi Levenson retired and Rabbi A. David Packman became our spiritual leader. Under his leadership, many new programs were added including the creation of the Intercongregational Sunday School and a merged youth program with Emanuel Synagogue. Rabbi Packman developed relationships with other congregations and created interfaith programming with Mayflower Congregational Church and established an ongoing Jewish/Catholic dialogue with Christ the King Catholic Church. He was the reorganizer of Oklahoma’s most inclusive Thanksgiving Service, which embraces Catholics, Protestants, Jews, Bahai’s, Muslims, Hindus, Unitarians and people of all races. For more than 20 years, Temple B’nai Israel and the NAACP have presented the annual Martin Luther King, Jr. Program. Our membership expanded to over 400 families and the Temple facilities continue to be modernized and expanded. After 28 years of service to our congregation, Rabbi Packman retired. In 2004, Rabbi Barry Cohen became Temple B’nai Israel’s fourth Rabbi. Rabbi Cohen placed special emphasis on growing youth involvement with our congregation and within the Reform movement. On July 1, 2012, Rabbi Vered Harris became Temple B’nai Israel’s rabbi, only the fifth rabbi in the congregation’s history.